Each year Wicked Local Media Solutions introduces a new round of the Reader’s Choice Awards in the Metro west area. Customers are invited to vote on line for their favorite community business in various categories. According to the creators, there is a lot of competition among businesses to win an award. 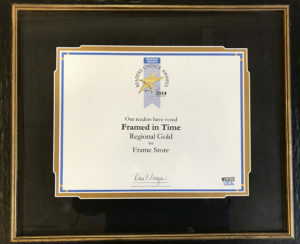 Therefore, we are proud to announce that Framed in Time has been voted #1 Frame Shop Choice and the Regional Gold Award for six straight years by area readers! In addition, Framed in Time has been awarded the #1 Choice for an area Gift Shop, in recognition of the wide variety of unique and ever-changing items offered in our colorful Artful Gift Gallery that accompanies our picture framing showroom at 2 Central Street, in the historic Saxonville Mill Building. Please stop in to see such teasures as pottery and jewelry from local artists, Fairly Traded hand crafted items from countries around the world and a huge selection of quilling cards, just to name a few. 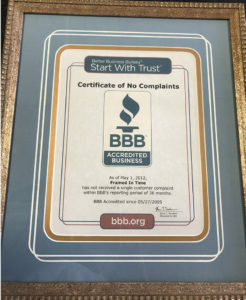 Framed in Time has also received multiple awards from the Better Business Bureau over the years. These awards are intended to recognize those businesses dedicated to the principles of ethical business standards and their commitment to reliability, credibility and promoting trust in the marketplace.